It sounded like it might be a lot of work, but I decided I needed to try out this recipe. I invited Dan over and together we made Goat Cheese Gnocchi with Bacon, Dates, and White Wine Sauce. We both had fairly high hopes, but occasionally I’ve tried out Food Network recipes that haven’t come out as good as they were supposed to so I wasn’t getting my hopes up toooo much. Though it took longer to make than we anticipated because we had to refrigerate the dough for a half hour and it took us a while to roll all the gnocchi, it was completely worth it! This dish was seriously AMAZING!!!! We were both head over heels for it! Dan went as far as to say it may have been the greatest meal I’ve ever made. I think I might have to agree! Here’s how to make this Goat Cheese Gnocchi with Bacon, Dates, and White Wine Sauce. First take 12 ounces of fresh goat cheese that is room temperature and combine it in a large bowl with 4 ounces ricotta (recipe says goat cheese ricotta but my grocery store didn’t carry it – cow milk ricotta worked just as well!) and 2 large eggs, also at room temperature. Mix until smooth. Add 1/2 cup flour and stir until combined. Add more flour, 2 tablespoons at a time, until the dough is smooth and supple but not too sticky. Be careful not to add too much flour or overwork the dough. Add just enough so that it’s not sticky. Wrap the dough in plastic wrap and store in the refrigerator for 30 minutes. While the dough is chilling, prepare the bacon, dates, and parsley. Dice 6 ounces slab bacon and set aside. Pit and dice 8-10 large dates and set aside as well. Finally, chop 1/4 cup parsley. When you’re ready to take the dough out of the fridge, put a large pot of water on the stove to boil. On a lightly dusted surface, press and shape the dough into an 8-by-14-by-1/2-inch rectangle. Sprinkle flour onto a sharp knife and cut the rectangle into 1-by-1/2-inch pieces. Making sure your surface is still floured, use a fork to shape the gnocchi by pressing a piece of the dough into the back of the fork slightly to create ridges, then rolling it down the fork. If the dough begins to stick, flour the fork and your fingers. Place the finished gnocchi on a floured cookie sheet. Repeat with the remaining dough. When your gnocchi are all ready and the water is boiling, prepare an ice bath. Season the boiling water with salt, then begin cooking the gnocchi in batches. Use a slotted spoon to place the gnocchi into the water and give them a stir to make sure they don’t stick to the bottom of the pot. Cook until all the gnocchi rise to the surface, then cook for an additional 1-2 minutes (about 4 minutes total). Immediately remove the gnocchi with a slotted spoon and place them into the ice bath to make sure they stop cooking. Repeat with the remaining gnocchi. When the gnocchi are cool, drain them. Next, heat a nonstick pan over medium heat. Add in the bacon and cook until crisp. Using a slotted spoon, remove the bacon to a paper towel-lined plate and set aside. Add the gnocchi into the pan and saute in the bacon fat about 2 minutes per side. Transfer the gnocchi to a plate. Add the dates into the pan. Whisk in 1/2 cup white wine and 1/2 cup vegetable stock. Simmer until reduced by 1/2, about 2-3 minutes. 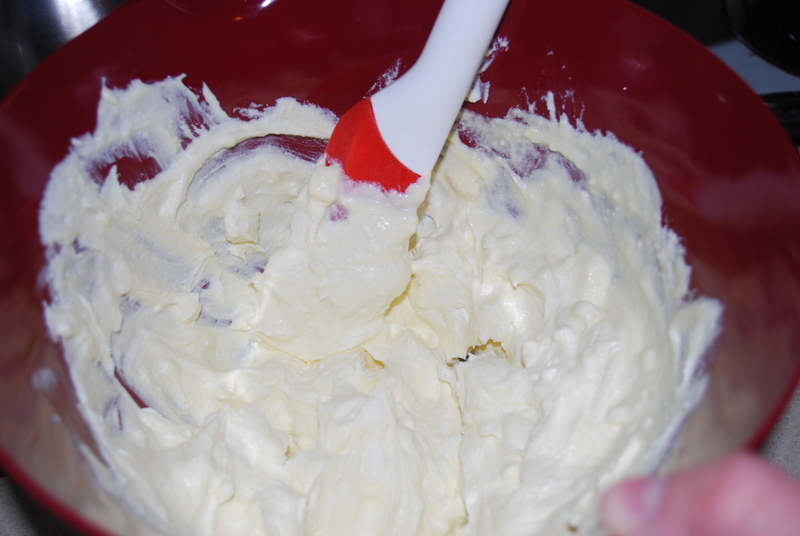 Whisk in 1 tablespoon unsalted butter. Finally, add in the gnocchi, bacon, and salt and pepper to taste. Stir in 3 tablespoons of parsley and toss to combine. Use the remaining parsley to garnish. Find the original recipe here at www.foodnetwork.com. Even though this dish takes a while to make (took me about an hour and 45 minutes), it isn’t difficult and it’s well worth the time. It’s perfect for a weekend meal when you’ve got a little more time to spend cooking. I will most definitely be making this again!!! And again. And again. I have to hand it to Damaris Phillips… this is one incredible dish! This entry was posted in Dinner and tagged bacon, dates, gnocchi, goat cheese gnocchi, ricotta, white wine. Bookmark the permalink.